PRAGUE, 20.10.2015 (Huffington Post) – The following remarks were given at a conference in Prague commemorating the 600th anniversary of the burning of Jan Hus. The conference was sponsored by the Law Faculty at Charles University and the Universal Peace Federation. 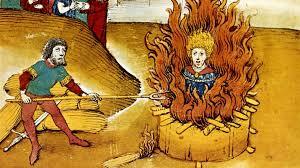 In a technical sense, Jan Hus had nothing to do with human rights. Human rights is a secular concept that emerged only in the Enlightenment, as a central element of liberal philosophy and political theory. Today it is fashionable, and perhaps thought to be strategic, to claim that human rights are something we have inherited from various religious traditions. But if we understand human rights properly, we understand that this is not the case. The major world religions have helped mankind to understand the value and dignity of individual human beings, that is, what human rights are there to protect. But they have not set forth the political and legal mechanisms that can make human rights a reality. In the Medieval period, Germanic customary law held that a king was under, not above the law. Kings placed themselves under moral obligations to treat subjects in accordance with Christian values, and there was a tradition of the right of resistance to kings who breached the law. But this is different from human rights. Human rights do not refer to kindly relations between authorities and citizens; even if no violations of rights and dignity occur, people who have no mechanism to sue for their rights and freedoms cannot be said to enjoy human rights. There is no idea of human rights to be found in traditional Islam. Islamic law enjoins rulers to treat their subjects justly and with compassion, but that is different from imposing legal constraints upon those in power, and giving those subjects the power to compel rulers to respect their human rights and freedoms. There was no idea of human rights in the ancient Jewish kingdoms, either. At the same time, there is, deep in the soul of our common monotheistic tradition, an idea whose revolutionary potential is very much alive to this day. It is the understanding given voice in Mosaic law, that if we are all truly subjects of one transcendent God, then no earthly king can completely rule over us; that God makes us free, and thus makes the powers of men ultimately irrelevant. And by the same token, as all subjects of one transcendent Deity, we are all morally equal, and thus owe to one another, the respect due to an equal. Human rights are protected by secular laws, but ethical monotheism is the foundation upon which the belief in the universal moral equality of human beings, and man’s natural and inalienable right to freedom, and human rights, were built. In the history of Western civilization, religions, governments and institutions have tended to stray from the principles upon which they were established. Authority becomes complex, bureaucratic, stale, and often corrupt, or was, as Max Weber said, routinized. The accretion of various interests erode the integrity of commitment to foundational principles and beliefs. Laws and regulations, doctrines and dogmas become obscure and inaccessible to all but a few expert intermediaries who are needed to interpret them for the average person. Jan Hus called for Christianity to return to the commitment to freedom and equality at the root of the Judeo-Christian tradition, and took his place among the great prophets and reformers of that tradition. As such, the life of Jan Hus, and his tragic execution, were key links in the chain of religious and intellectual development that led to making human rights one of the main political ideas of the modern era. He questioned the prevailing powers in his sermons and writings, but even more powerfully in the way he himself lived. Jan Hus’s own life, and death, were his most influential legacy. His virtuous character was, in itself, a challenge to the widespread corruption and hypocrisy of the Church. But when we study accounts of his life, including those of his contemporaries, there are few clues to what it was about Jan Hus that carried the sense of sanctity he possessed. Jan Hus could love other people, even those who wished him ill. He was a vivid, down to earth, and common sense person, yet at the same time detached from the profane world, and animated by idealism. Perhaps the reason for his charismatic appeal was this ineffable and seemingly contradictory mix of qualities, which embodies the spirit of his faith. His conflicts with the clerical authorities and his trial show that some things have not changed since the Middle Ages. The trial of Jan Hus was a farce, just like the trials of dissidents, members of religious minorities and human rights defenders in authoritarian societies today. He was denied legal counsel. No evidence was presented to substantiate the charges against him. Jan Hus tried to defend himself by reference to the Bible, proving he had done nothing to contradict, or to discredit, the core teachings of the Church, but he was given hardly any opportunity to do so and his reasoning was dismissed. Like some who fight for human rights, Hus aroused fear among the authorities, who burned his books before burning him, and who, in a vain attempt to stamp out his memory, ordered that nothing, no bones or ashes, should remain. But Hus, loyal to the laws of his society, accepted his punishment, praying for his accusers. The fidelity to law has been a central principle and a moral commitment of human rights advocates. The dissident human rights communities of Soviet times were faithful to law, even unfair laws, and took as their task to hold abusive governments to their own constitutions and statutes. Disciplined legalism has been a key to the essential non-partisan quality of human rights–not to seek power, not to partake of a political agenda. Human rights must stand outside of politics in the realm of principles and morals, and at its best, partakes of some of the detachment that identified Jan Hus as a proponent of the truth of the Gospels, who cared nothing for earthly riches or rewards. Jan Hus preferred to accept the punishment of being burned at the stake rather than compromise the truth, and in doing so, he demonstrated his God-given freedom, by refusing to relinquish it. He defined religious freedom by exercising it. His most famous words, which stand on his memorial in Prague, are: “Seek the truth, hear the truth, learn the truth, love the truth, speak the truth, hold the truth and defend the truth until death.” The phrase has been an inspiration to Czech leaders, and many others seeking independence, freedom, democracy and human rights. The dissident human rights defenders, including Jan Patočka and Havel in Charta 77, found freedom in seeking and acting upon the truth. They insisted on what was essentially a scientific approach to human rights. Human rights were defined in international standards based on universal principles. Whether or not governments obeyed these obligations was a matter of fact to be discovered by empirical methods. The role of human rights defenders was to resist propaganda, to detach themselves from any national, ethnic or religious biases; to live outside the power structures of society, and to seek uncompromisingly and learn the truth. Some, including Patočka, paid with their lives for their devotion to truth. We may conclude that one of the greatest contributions Jan Hus made to human rights was affirming that truth exists and can be known, something often doubted in Post Modernist thought. Another was his exercise of freedom that, after 600 years, is still a model of moral courage. Aaron Rhodes is president of the Forum for Religious Freedom Europe. He was Executive Director of the International Helsinki Federation for Human Rights from 1993-2007, and later co-founded the Freedom Rights Project. This entry was posted in Uncategorized and tagged freedom of religion, Human Rights, Jan Hus. Bookmark the permalink.